The world’s first-ever floating dairy farm is set to open in the Dutch port city of Rotterdam at the end of 2018. This dairy farm is being launched by the Dutch property company Beladon. 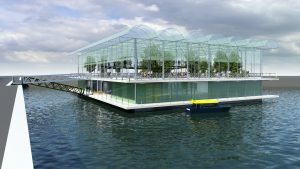 The idea behind this floating farm is to utilize unused space in the water as an alternative to the increasingly scarce land and shortening the distance between grocery stores and farms. The farm-on-water will have about 40 cows. Milked by robots, these cows will yield 800 liters of milk per day. Robots will also be responsible for managing manure, which will be used as fertilizer on the farm and throughout Rotterdam. The milk and yogurt produced on the farm will be sold in the local area. Set in the middle of the port, the farm will have three levels. The top floor will house greenhouses for clover, grass, and other crops to feed the cows. The middle level will be a floating home for cows. Populated with artificial trees, it will resemble a natural garden. The cows will be free to graze on solid ground in an adjacent field they can access via a ramp. Finally, the bottom floor will have a processing plant to turn fresh milk into consumer products. The floating dairy farm will be anchored to the ocean floor. It will sway only a few millimeters, even in bad weather — not enough to cause any stress to the cows.